As I opened the envelope from a local winery I was assuming it was word of an upcoming release. Sadly no it was not. 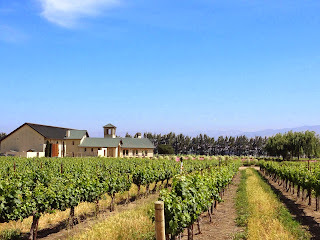 It was a letter telling me that the tasting room on HWY 68 was closing and they were consolidating to their Soledad winery location. 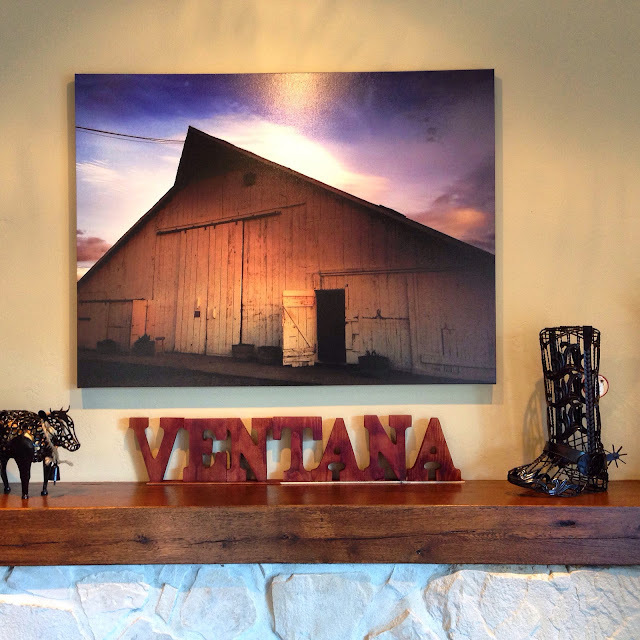 A business decision to be sure but the deck at Ventana Vineyards tasting room on HWY 68 was to be no more. I, we, us have enjoyed many a tasting here and oh so many meetings where extra bottles have been purchased to libricate our brains. 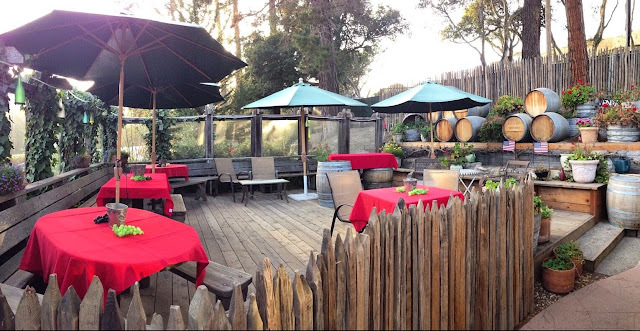 It was such a great place to meet up with friends or to simply enjoy some nice wine in a lovely location that was pretty darn convenient. A super place to grab a taste and buy a bottle to take next door to Tarpy's (no corkage) and have a great dinner was also a nice bonus. As the melancholy settled in my thoughts ran to, what's next. Surely they can't just settle for a remote winery location that has only reasonable foot traffic on weekends. At this point I don't know what the future holds but the wines deserve more.With a lineup of good reasonably priced and with some great ones tossed in there, there must be a better option. I'm sure at some time in the future one will prevail. I plan to talk with the decision makers to find out and share the future plans of Ventana, while in the meantime I have to reassess the weekday drinking er meeting places available. 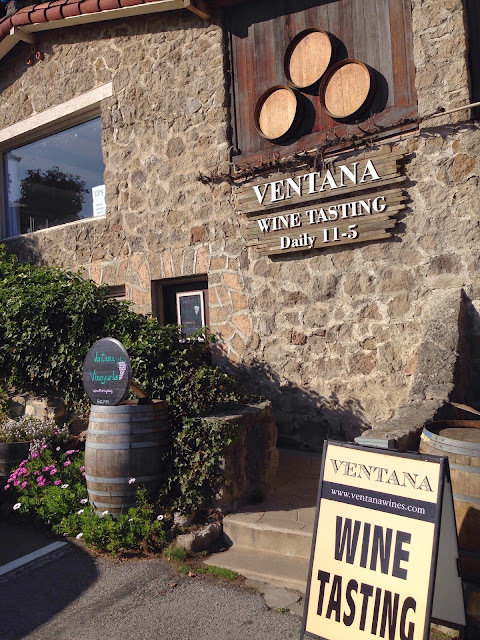 I head out to the Ventana tasting room this holiday Monday to just taste, get a glass and sit in one of the best places to enjoy a beautiful day in Monterey. So after a couple decades of pouring wine in this amazing spot a new dawn arrives where this is no longer available. It's not a pleasant thought that I won't get to have this simple pleasure any more. Stay tuned. The story continues. So here we are at the beginning of 2015 and what a crackin wine to start the year. Oh, and yes it has been said one should not start a sentence with a coordinating conjunction. So where were we. Wrath Wines crackin 2012 Swan / 828 Monterey Pinot Noir. 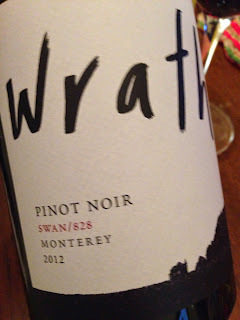 It has been awhile since a Wrath wine has been consumed, not because they are not enjoyable but there are just so many wines and so little time. After opening this one to have while preparing and having dinner we were reminded of just how lovely their wines are. This bright pretty to look at wine has an enticing nose of cherry, both red and black as well as some floral notes and just a hint (just enough for interest) of that funky forest floor that can often be in your face but not in this one. On the palate the cherry theme continues with some other blue and black fruit flavors to tantalize the taste buds in this very nicely balanced wine. Simply put, this is a lovely wine to drink and and let linger for a while with its lovely finish. This wine has 20% whole cluster fermentation and equal parts Swan and 828 clones, aged for 10 months in French oak barrels of which 22% are new. With all this babbling as you would deduce a rating of *** and 7+ should be no surprise. Head on down to the tasting room on River Road Wine Trail or in the Carmel Plaza and taste the range, just don't miss this one. A few weeks ago it was decided to get away for a couple days between Christmas and New Years and after much discussion it was decided to make it Cambria California. Next up was finding a room last minute. While there are a lot of choices the fact we left booking so late did limit our options. We found a great room thru Cambria Inns. 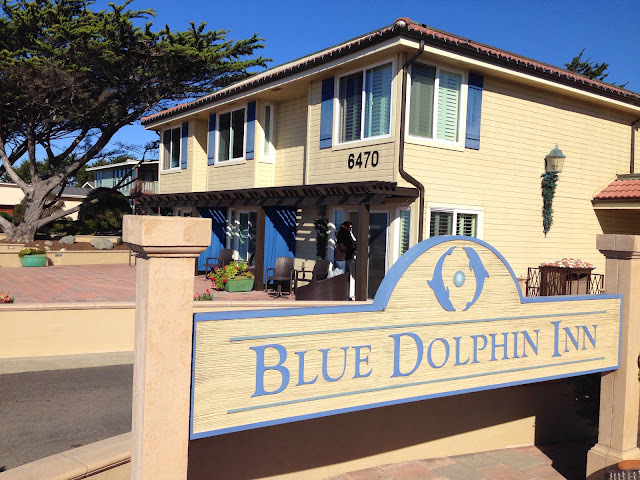 We stayed at the Blue Dolphin Inn in one of the full ocean view with patio rooms and it was just wonderful. 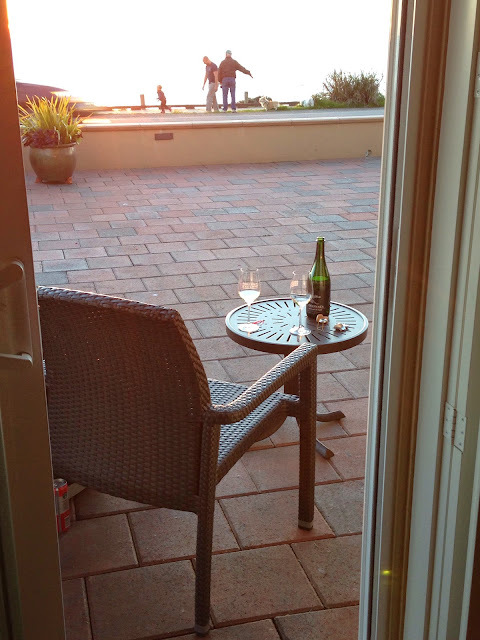 The Estero Bay Full Ocean View King with Patio is a lovely well appointed room that is modern yet comfy and welcoming. The view from the patio is just spectacular except when there are vehicles parked in front of you. We watched whales swim by through the binoculars that are provided in the room and enjoyed a spectacular sunset. With a Keurig for making coffee or tea, a microwave and a small refrigerator to keep the bubbly cold and a nice telly DVR setup it is all set for your comfort including WiFi and a realistic looking electric fireplace. We may try the upstairs ocean view rooms next time just in case the weather is not so magical. Arriving a couple hours earlier than planned it turned out our room was available and we were able to check in early which was a nice bonus. After settling in it was off for a walk along the beach front on the board walk. On what was a spectacular afternoon (never guess it is winter) with the sun shining a light breeze walking in a t-shirt by the shimmering water watching the whale spouts in the distance while enjoying the restful atmosphere. 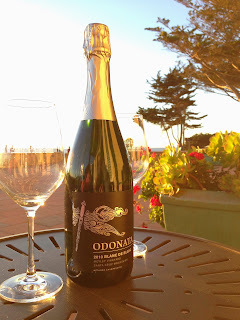 Once back to the Blue Dolphin it was time for a couple glasses of Odonata Blanc de Blanc. The bubbles of choice that had been brought with us for just this occasion sitting watching an amazing sunset. Does not get much better. Later that evening it was up to the Cambria Pines Lodge for dinner. A good meal but far more old style family dining than had been anticipated. Good meal at at reasonable price. The next morning the comfy bed was hard to leave but the wonderful picnic breakfast from the Blue Dolphin Inn was calling for us to enjoy on the patio. 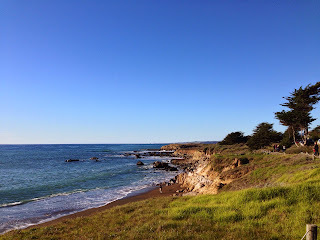 Enjoy we did in the lovely sunshine of Cambria. It was a great stay at The Blue Dolphin Inn and we will be back. We would not hesitate to 'recommend' you stay here if the opportunity presents itself. We drank o lot of wine in 2014. We drank a lot of good wine. We did find a few 1's and 2's as well. 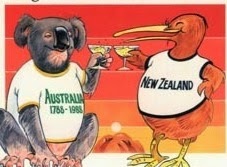 In looking back we also drank a lot of very enjoyable wines for very reasonable prices. 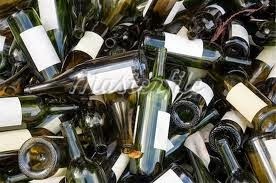 A lot of **** wines. While some of these wines were really good some were good and very inexpensive making them great for a week night meal at any time. Wine to be shared and enjoyed because you can. We made a conscious decision to focus more on less expensive wines this last year to help make wine more accessible and more everyday drinkable to the average bloke n sheila. While we are not even suggesting that for **** price you can get the equivalent of a Penfolds Grange, an Alban Reva, Chateau Lafite Rothschild, Pauillac or even a Two Hands Wines Bella's Garden Shiraz, Barossa Valley. But what you do get is wine to enjoy all the time that you can afford and then making the occasional foray into * and ** territory that much more exciting and the journey into NO STARS FOR YOU territory almost magical. Of the many dozens of wines we drank this last year, why these you ask? For starters they all punched above their price point. Most all of their price points were **** making them great value. 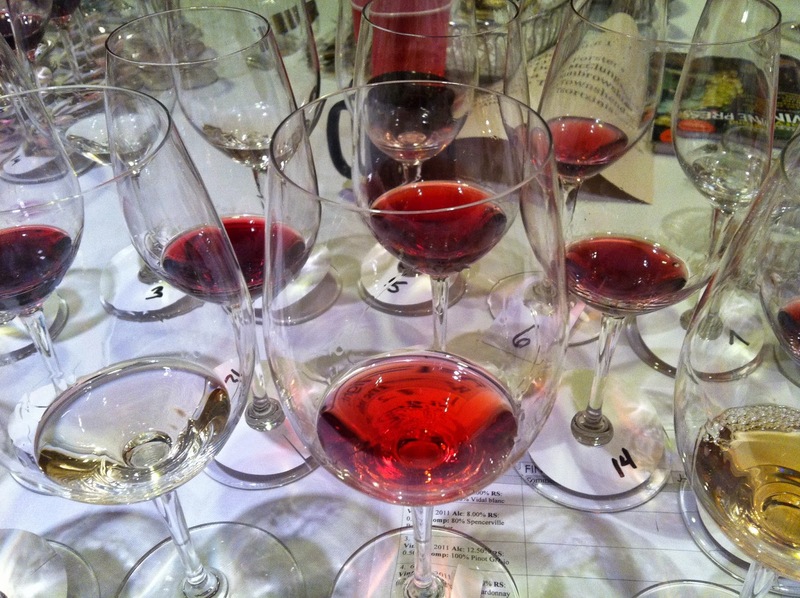 They also made us stand back and think about the wine and price balance and how much we enjoyed drinking them. They had a great price and tasted great and could be enjoyed any time and with anyone. Heres hoping we find many more in 2015. 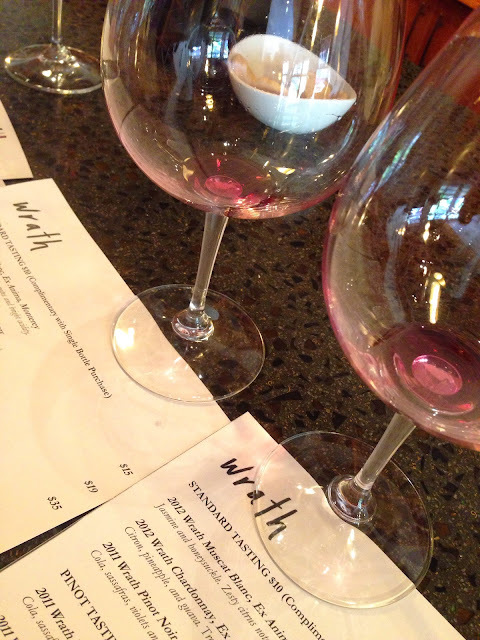 What were some of your favorite wines of 2014?